Editor’s note: This is the second in a two-part post by Jack Bird, of the Center for Science, Technology and Society, which developed the Energy Map – an online tool that plots the work of more than 60 distributed energy enterprises in Africa, India, South East Asia and Latin America. In part one, the author notes three business model challenges that stand out: organization financing, product affordability and distribution. That’s where we pick up in this post, in which Bird also explores key business models that have emerged in off-grid energy development. Click here to follow the NextBillion series, Going Off Grid. 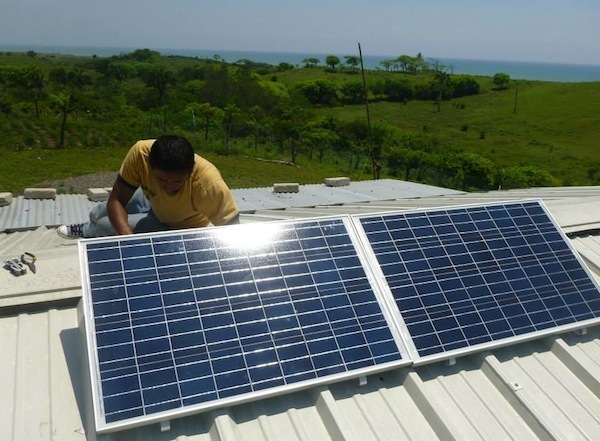 Operating in the developing world means that distributed energy enterprises must overcome the distribution issues associated with isolated communities and poor infrastructure. Distribution not only involves the physical movement of the product to the end user, but also things such as installation, servicing and maintenance that require an ongoing relationship. Often, the social impact theory of the enterprise will determine the distribution model. For instance, an enterprise with small products focused on reaching a large number of people may choose a low contact distribution model, whereas an enterprise dealing with large systems that require maintenance will focus on a higher contact model. We identified seven major distribution models from the enterprises on the Energy Map. Perhaps the simplest model is one that does not involve the transfer of products, but of knowledge instead. For instance, The Center for Rice Husk Technology at the Central Luzon State University in the Philippines focuses on developing rice husk gas technologies and sharing this information with other enterprises in the form of handbooks and manuals. About five of the enterprises on the Energy Map focus on free and open sharing of knowledge, although the word “enterprise” may not be the best descriptor for them, in that they are more akin to think tanks and non-profits that align with other businesses. The next model makes use of existing retail channels, and although it involves the movement of products, as far as the enterprise is concerned, this is a low-touch model. Six of the enterprises on the Energy Map make use of this model. The enterprises seek to partner with wholesale distributors that already have established retail systems. This works best for enterprises that are selling a small, simple product that does not require a lot of maintenance, such as a solar lantern. For instance, VidaGas sells liquefied petroleum gas through retailers that already are selling in grocery stores in Northern Mozambique. This way, VidaGas does not have to worry about reaching buyers on its own. Similar to the previous model, the next focuses on partnering with distributors – but only those that can provide the right training or service to customers. There are 19 enterprises on the Energy Map that partner with other organizations to make their sales. This works best for enterprises that want to reach a large number of people, but have a product that requires a certain level of training that a wholesale distributor cannot provide. For example, re:char makes use of an on-the-ground network of salespeople and demonstrators to get their bio-char kilns out to customers and provide the necessary expertise to operate them. They also partnered with ACO, a Kenyan development non-profit that helps train users. 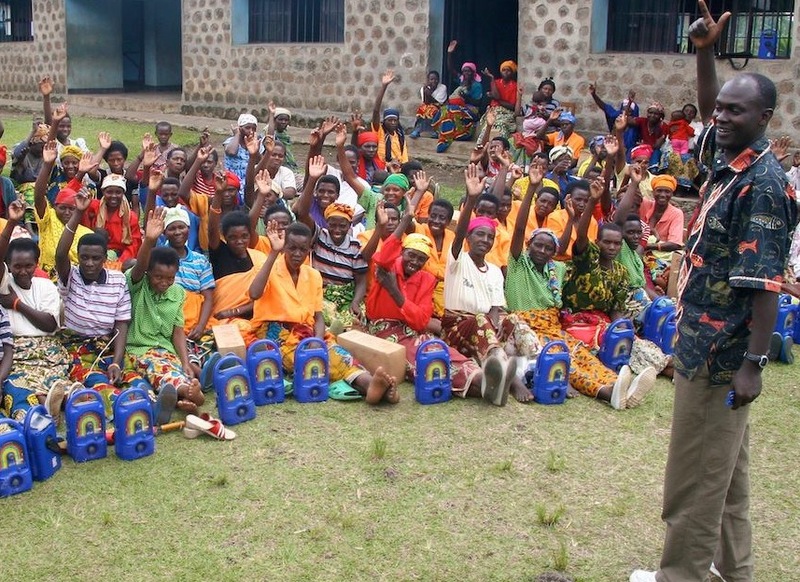 (Above: Women in Rwanda show off their solar powered educational radios from Lifeline Energy, which works with NGOs and charities to improve rural education. Image credit: Lifeline Energy). The next model involves contract sales and is usually associated with larger products, or products that are used for things such as education or health care. For example, Lifeline Energy contracts with government or non-profits that are working to improve rural education. Lifeline sells its solar powered educational radios to these institutions, which then take care of distribution. There are ten enterprises on the Energy Map practicing this distribution model. This model is best for enterprises that want to ensure a long-term relationship with whatever organization is implementing their technology, such as governments, schools or health clinics. These relationships help to ensure that the product is used appropriately without requiring the enterprise to be responsible for operating the systems. The next model, microfranchising, is similar to the model using existing distribution channels in that it uses local retailers. But it is better suited for enterprises that have a stake in the region in which they are operating, and that provide products or services that require customers to return. About 12 enterprises on the Energy Map practice this model. This distribution strategy works best for businesses that rely on a monthly fee or a pay-as-you-go system for things like rechargeable batteries or rental systems. Microfranchising helps to build a local economy, and can standardize the distribution system for enterprises using this model. One step up from microfranchising is the use of in-house salespeople. There are 14 enterprises on the Energy Map that hire their own employees to sell their products. Often these enterprises have branch offices from which they base their regional distribution channels. This model is well-suited for high-tech or relatively expensive products that require the enterprise to be involved in maintenance and financing operations. For instance, Ilumexico focuses on a last-mile distribution system and local branch offices to reach isolated communities. These branch offices are run by Ilumexico employees who help to sell and maintain the products, and train buyers. The highest touch distribution model, employed by 14 enterprises on the Energy Map, relies on community based implementation. In this model, the enterprise—typically a non-profit—is actively involved in the communities in which it operates and often has a community development mission much broader than providing distributed energy. This model is suited for enterprises that require extensive training and long-term financing or maintenance operations. Many of these enterprises focus on holding workshops and helping to train community members to either produce or operate the systems themselves. Often these enterprises have complex products that require a lot of attention, and therefore they focus on a holistic impact approach rather than a numbers-reached approach. Although expensive, this strategy ultimately provides the highest quality service to the end use customer. So What Business Model Works Best? The answer to this question is entirely dependent on the technology, the target market and the resources of the enterprise. No one model is the silver bullet for providing the 1.3 billion people suffering from energy poverty with clean, reliable and affordable energy. In fact, most of the enterprises featured on the Energy Map make use of several of these strategies simultaneously to achieve their objectives. The complexities of energy poverty are mirrored by the diversity of business models being used to overcome the many barriers that exist. There are, however, a few takeaways from the information presented here. Increasing the number of people reached often means sacrificing the depth of the impact. Enterprises must clearly define their objectives and scope in order to avoid running into too many costly barriers. Debt and equity are good, but grants are still critical. Even the most established for-profit enterprises on the Energy Map still rely in part on grant money, making it a crucial funding mechanism for this space. The more complex the technology, the more involved the distribution model must be. Although complex solutions often offer a more holistic impact, they also require more training and a larger commitment from the enterprise. The leader can only do so much. Although subsidies and self-funded endeavors have few strings attached, they are ultimately un-scalable and risky once the enterprise has surpassed a certain level of growth. Although there is much work to be done to bring innovative solutions to those suffering from energy poverty, the experiences of the enterprises on the Energy Map can shed light on how different strategies can be used. It is unlikely that one enterprise will scale enough to end energy poverty, but these business models are primed for replication in other areas of the globe. Jack Bird is a recent graduate of Santa Clara University, and is working as a research assistant for the Center for Science, Technology and Society’s energy sector.